Sweet Rose Creamery comes with a pedigree: its owners, husband and wife team Josh Loeb & Zoe Nathan, also own and run Milo & Olive, Huckleberry Cafe, and Rustic Canyon Wine Bar & Seasonal Kitchen. Its chef, Shiho Yoshikawa, worked in the kitchens of Tartine (where she met Zoe). But its pedigree is not what drew me (and the persistent lines of frozen treat seekers) there. The ice creams, sorbets and dairy free treats are made small batch, from scratch daily using organic milk, cream, antibiotic and hormone free eggs, plus fresh seasonal ingredients from the reputed best farmers market in the city: Santa Monica Farmers Market. 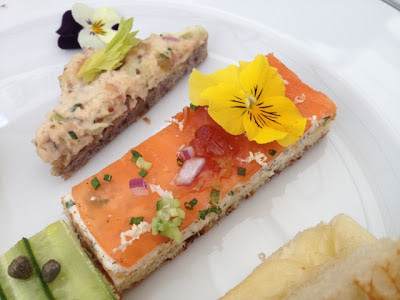 You can taste all the care they put into their products - and they also definitely keep their menu interesting with unusual flavors from Rose Geranium with Raspberry Ripple to Honey Goat Cheese. 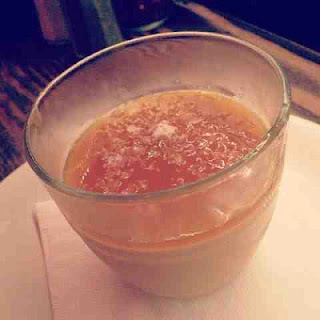 Loquat Compote: great little bursts of brilliant orange loquat. Dessert Tomato: love savory ice creams and this had a nice balance of sweet and slightly tart - though I'm glad I tried it, it's not one I would repeat. Cherimoya: this one was hands down my favorite - first time I had seen this flavor in ice cream I think - and after sampling it I not only got a scoop but snagged a pint to go! Apparently I had just caught the end of the cherimoya season and wanted to stock up before the flavor went off rotation. Though the ice cream is in texture not as smooth and creamy as Neveux, the flavors are unique and the location is convenient for Westsiders (and especially for me). The adorable location at Brentwood Country Mart is just the next complex over from Pressed Juicery - a must stop for me at least once a week for my Greens in liquid form. 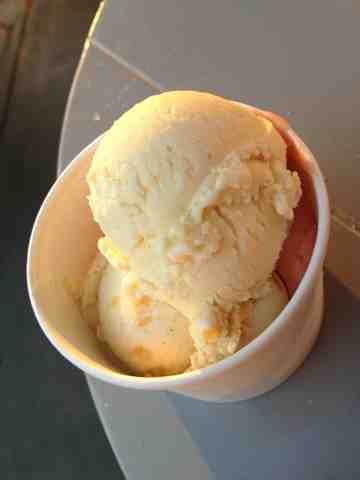 Couldn't believe it had taken me this long to hit up Sweet Rose Creamery when it is practically right next door. On any given day/ night of the week there are throngs of people in line in & out the door, or enjoying their treats on the patio tables. Will definitely be adding it to my itinerary for my ritual stops at the neighboring complexes especially this summer: Pressed Juicery, Farmshop (for croissants/pain au chocolat), Sweet Rose Creamery. (Love that they - SRC - are open late too - til 11pm daily). Now that we're in cherry season - can't wait to go back to check out what chef Shiho does with them! Too cheesy. Too dense. Too acidic. Words that describe my usual reaction to pizza of ages past (and maybe myself, in general, but that's a whole different post...). 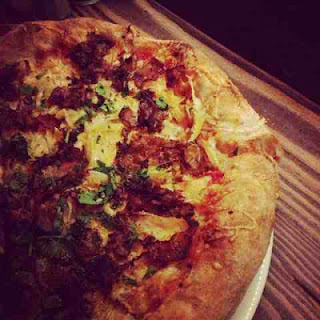 Pizza has come a long way, especially in LA. I fell for Chef Jeff Mahin's, with its incredible crust made with specially formulated dough allowed to rise to perfection (in individual jars!) at Stella Rossa (name now changed to Stella Barra) last year. So I was excited to see chef Jeff opening up a second location recently in Hollywood (on my way home!). AND parking was easily had at the Arclight cinemas structure - the restaurant is on the corner of the complex on Sunset Blvd. I went on a Monday night to avoid the Hollywood crowd, and while the place is still new to the neighborhood, was able to slide in for a table pretty easily. 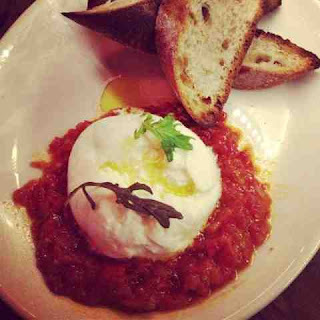 I started with the Fresh Local Burrata ($10.95) with roasted tomato jam, house-made bread, sea salt, arugula. All I have to say is, if I only had a month to live and could only eat any of the three ingredients on this plate until then, I would die a happy eater. (Well, I'd have to break for foie, and uni, and truffle...and jamon iberico. But besides those...you get the point.). Every individual component of this plate was equally perfect on its own and in balance with the others - the fresh made burrata was a perfect consistency, the top broken through to unleash its soft creaminess enhanced by some fantastic olive oil, in perfect harmony with the amazing tomato jam below - which is also just right - not too sweet as the name seemed to suggest, but somehow exactly at the center of the intersection of savory, tart and sweet. The texture is almost like a marinara sauce but a bit chunkier. The two could induce foodie ecstasy on their own - but there was still the housemade bread. That incredible fresh baked artisanal bread with the crisply crumbling crust and the flavor packed soft yieldy interior...finishes off the (un)holy trinity on this plate. I actually really can't stop thinking about it, and need to go back soon. The next thing I had literally left me no choice once I spotted it on the menu: Porchetta & Fennel pizza ($15.95): caciocavallo, parmesan, Calabrian chilies, smoked paprika oil, parsley. Stella Barra's version was beautiful: with their porchetta like shavings of pork baked to crisps - it was still delicious, but just different from what I had in mind (fair comparison or not). Slivers of fennel were softly crunchy, their mildness counterbalancing the bit of heat from the chiles. The mix of flavors made the pizza overall remind me of a sausage/pepperoni pizza - except with 10 times fancier ingredients. The crust still rivals some of the best in town, but I felt wasn't as mind blowing as the ones at the Santa Monica location (because of the lack of wood-fired oven?). My absolute favorites from the SM location are the Shaved Mushroom (truffle) pizza and Bloomsdale Spinach (yes you read that right) pizza - so think I will try those next time I'm back at the Hollywood location to see how they compare. Overall, this is a great new addition to the area and a definite must stop for people looking for good food before or after a movie at the Arclight. Venice, CA can seem like a tale of three cities to a non-resident: the grungy, need-a-shower-desperately-after, only-ondemand-by-outoftown-visitors side pretty much all along the boardwalk; the post-college, now-in-possession-of-disposable-income-yet-still-very-indie-spirited-locavore side on boutique-filled artsy Abbott Kinney; the semi-suburban-but-heck-no-we-are-not-cookiecutter-Santa-Monica side pretty much the remainder of Venice. Superba to me fits in somewhere between that second and third city. One of my dear friends subliminalrabbit recently moved to an apt a few blocks from there. A few weekends ago we decided to get together for brunch, along with subliminalrabbit's hubby and Ms Sassy - and when I posed the all important question of where to eat, to the general Twitter population - Superba came recommended by almost every person who answered. The only problem with Superba was, they don't take reservations for brunch (because chef Jason Neroni's inspired take on casual Californian has justifiably driven reliably large crowds every weekend) - my friend is in her 3rd trimester, and we didn't want her to be on her feet waiting around the notoriously packed brunch seekers here for a table. That's when Wagstaff, Superba's PR agency, came to the rescue - they had seen my tweet and very kindly reached out to help set up a reservation (thank you Wagstaff)! The open, airy casual chic space immediately set us at ease - and because it was the morning of St. Patrick's Day, the place was actually uncharacteristically laid back - only a few tables were occupied when we arrived. 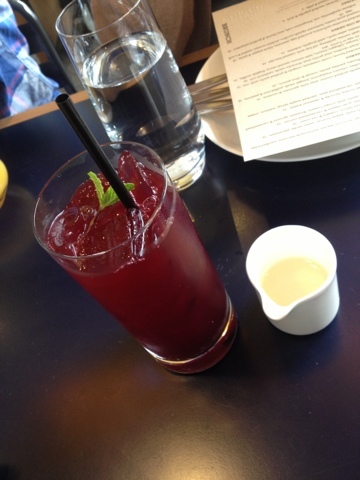 I started with a Hibiscus Iced Tea which was delicious served with simple syrup on the side!!! (Yes, I am a bit obsessed with this: there are two types of iced tea servers in the world: those who know who to serve it properly (with simple syrup) and those who are too lazy to boil water with sugar (serving as they have for decades, sugar packets which for the ^&*^%th time, does not melt into COLD tea no matter how much you stir - YES this is a pet peeve...). So count me impressed with Superba's iced tea service, from the start. Ms Sassy went for the eggs benedict, poached eggs, broccoli leaves, buttermilk biscuits, smoked ham, herb hollandaise ($15) - beautifully plated with the ham and the sauce very much more refined, lighter than many other restaurants that serve this brunch staple - which she thoroughly enjoyed. Subliminalrabbit, happy that Superba has vegetarian friendly options, went for the salad of black kale, jalapeno pickled raisins, pine nuts, pecorino & crouton ($12) - a skillful balance of textures, colors and flavors. 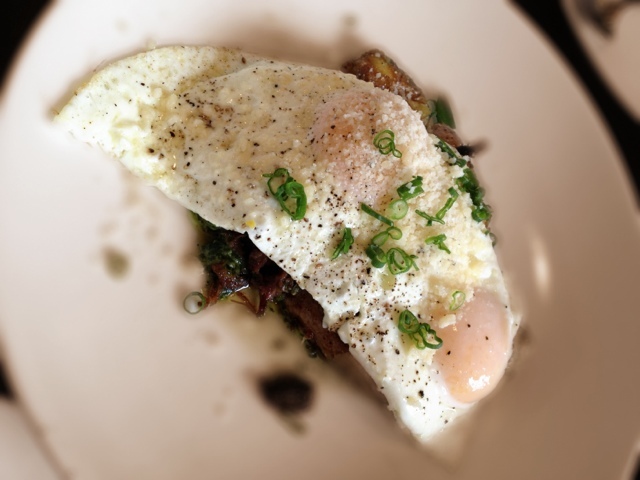 We all wanted to try to the Short Rib Hash topped with fried eggs so I got that as a 2nd entrée...not realizing that Mr. Subliminalrabbit had already ordered the same. In any case, the tender, juicy, flavor packed short ribs were perfectly tempered by the fried eggs, especially its liquid gold centers! So what was my 1st entrée then? 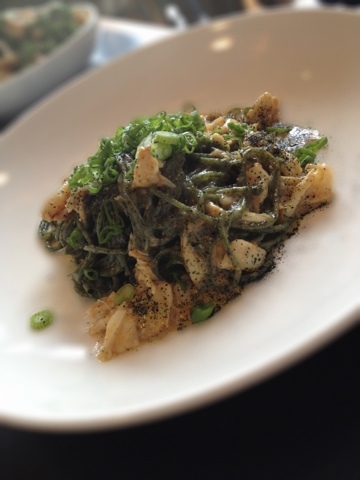 Something unexpected for brunch (also available on lunch and dinner menus): wakame spaghettini, uni, Dungeness crab, miso butter & pickled jalapenos ($18) - delicious waves of briny umami enfolded seaweed infused pasta that you can taste is fresh made (once you go fresh made pasta it's unimaginable to have it any other way), with the sour-heat of the pickled jalapenos coming through as a pleasant surprise. I loved that there were hefty chunks of fresh crab in there as well - brunch of champions. 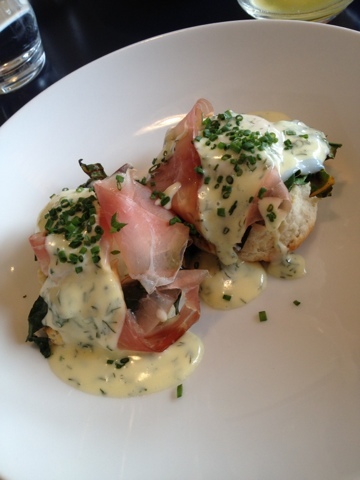 All in all, a fantastic brunch and we will definitely be planning a trip back soon! I love ads. Creative ones that also manage to serve their purpose. I have always been in awe of copywriters as commercial artists: how they are able to so concisely convey and burn into your memory, what they want you to know of the essence of a brand/product in 30 seconds or less, and often with one deceptively simple but oh so skillfully crafted tagline. And one of my favorites is from Southwest Airlines: "Wanna get away?" Often, the reaction is immediate, visceral and resounding: "YES!!!!" But, as any functioning adult - who has not inherited or earned an amount of money large enough to enable them to do whatever the heck they want, whenever they want - knows all too well, getting away is not always possible at the moment that you most want to do it. 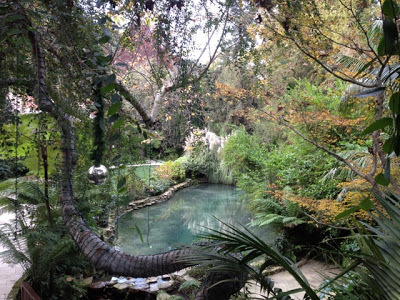 Which is why I love and appreciate places like the former Gonpachi, and Hotel Bel-Air - that let you feel like you've escaped to another time and place, a therapeutic safe haven, without any more planning or investment than a few hours and a fraction of the cost and 'production' level logistics of actual travel. Ms Sassy and I drove up easily on a Saturday afternoon, up lush, windy roads that opened up to a reclusive retreat that for some reason made me think of that movie from the 80s: Secret Garden. We had read about swans at the hotel, but on that slightly overcast/chilly January afternoon we didn't manage to catch sight of them. The elegant, white-themed tea room has an outdoor seating area - we settled into a semi-circular booth under a heat lamp and immediately vowed to return when during warmer weather. Afternoon tea here involves a prix fixe set of sandwiches, scones, dessert bites and all you can drink teas for $60 per person. 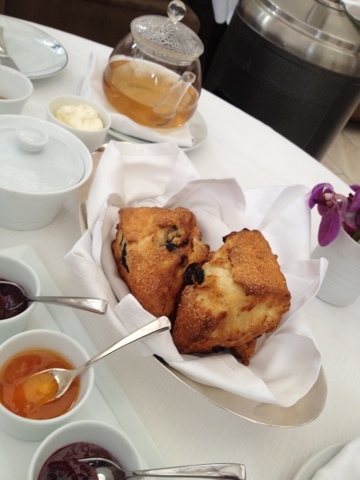 The scones were impossibly flaky, soft yet pleasantly weighty, and packed with flavor - though not so much that they overwhelmed the jam, marmalade & butter that came with them. I wanted 20 more of these and was only able to maintain some decorum so as not to embarrass Ms Sassy too badly. With your afternoon tea set, you also get your choice of all you can drink Loose Leaf Teas: and you can switch flavors as much as you want with each new pot! If memory serves correctly there were about 18 different teas on offer including original blends like Hotel Bel Air Swan Song blend of Guayusa, White Tip Jasmine, Hibiscus, Green Rooibos or Sacred Orchid with lilac and gardenia scent or you can choose from classics like Royal Chrysanthemum Blossom, Earl Grey with Bergamot, Assam, or Silver Needle. All were light, clean and refreshing. 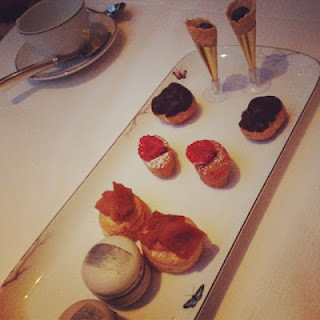 Unfortunately the dessert plate was not as impressive as the others earlier in the set - there wasn't any single item that was particularly memorable. 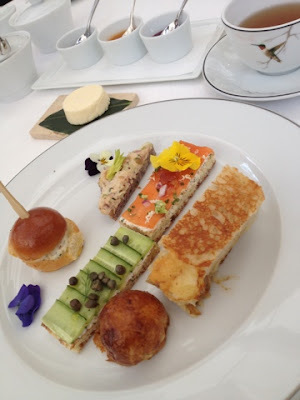 But the exquisiteness (yes, you have to use that word at least once when talking about the civilized activity of afternoon tea, with pinkies out and all) of the plates preceding more than made up for this last one. All in all, a great place to escape for an afternoon - a beautiful, quiet reflective place where you can hold actual conversation without stressful battles with traffic, parking, nor distractions of the usual hustle & bustle of most restaurants 'in the city'. It comes at a price, but we thought it was well worth it, and plan to be back again soon. Sycamore Kitchen: Hatfield Pastries Half Price Starting 4:30pm Daily! Hatfield's, the restaurant, has been on my To Do list for forever, yet somehow I still haven't made it there. But just down the street, in a far more casual, laid back "urban bakery-eatery" by the same power-couple-chefs Quinn and Karen Hatfield, I could pop in for a quick, affordable bite. The space is industrial-rustic, which does give it a 'colder' vibe even in the perpetual SoCal sun on the patio - not a soothing place to linger for hours chatting with friends or people watching, but a comfortable enough spot to grab quick pastries and coffee. Last week, on a Saturday afternoon, I stopped by close to closing due to sheer laziness - which will no doubt be repeated many times in future since it was rewarded by a fantastic deal! Apparently, starting at 4:30pm every day that Sycamore Kitchen is open, all their pastries are 50% off til closing (5pm). Makes sense as a quality control measure, as the pastries won't keep til the next day anyway. 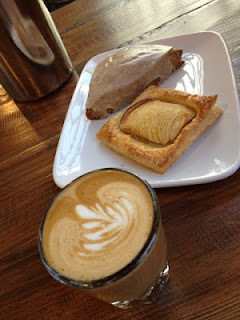 So, I kicked off with a Oatmeal Brown Butter Scone ($3 regularly) , and an Apple Galette washed down with a glass of Vanilla Cafecito ($3.75). I had actually been looking forward to trying the sour cherry buttermilk scone, and settled for the oatmeal brown butter only because they were out of the sour cherry one - I should know by now not to settle for substitutes, but the oatmeal scone was too grainy in texture for me. The apple galette was tasty, but not as buttery and flaky as the foodgasm-inducing ones at Chaumont. As I was headed to San Antonio the next day for work, and foresaw lots of heavy Tex Mex in my future, I decided to temper all the carbs with a pay-it-forward detox Market Salad ($13). 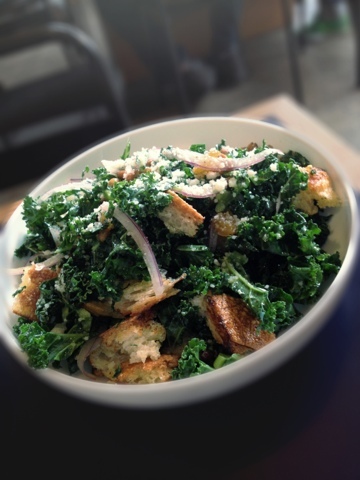 Sycamore Kitchen is known for their pastries, but since I only had a day in LA between two almost back to back business trips, I decided to give the salad a try. 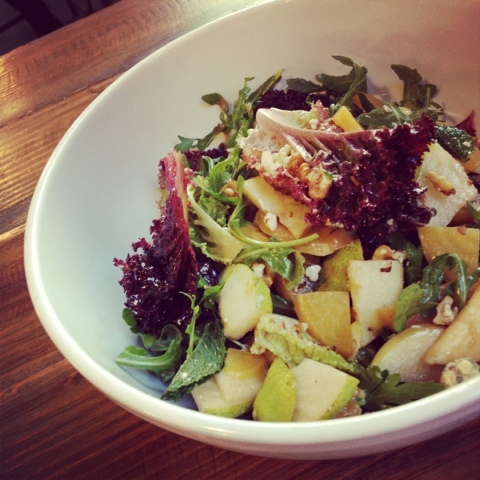 It came in a giant bowl with pears, apples, golden beets, mix of leafs - I loved the taste of every element, which were farmers market fresh - except for the parsley which added a slightly overly pungent herby flavor. The babka is much lauded across the board by critics and blogs as far as I'm aware, but it was much too heavy of a sugar bomb for me - I am a much bigger fan of the lighter, more subtly sweet mini-bundts. All in all, the pastries were not mind-blowing, but very good for the price (and especially after 4:30!) 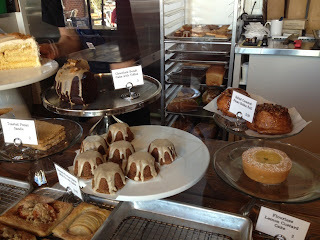 and I will be back to try other things from the extensive pastry case next time I'm in the neighborhood!